Ramesh Raskar and I are running MIT Imaging Ventures ~ Cameras, Displays, Visual Analytics & Apps again this Spring 2012! This is an Action Lab class designed to help students conceive of and launch startups based on new imaging opportunities. We study the landscape of imaging developments, plan and prototype new ventures & products, and brainstorm towards a startup, business unit, non-profit or citizen sector organization. To bring imaging research to the real world, the students will be encouraged to build teams and craft a business plan. The class will include live case studies of established and emerging businesses, through talks by invited business speakers, as well as surveys of commercialization and the innovation landscape in every arena of imaging including Mobile Camera Phones, Cameras in Developing Counties, Image-Search, Scientific Imaging, Medical Devices, Online Photo Sharing, Portable Displays, Large format visual interfaces, Computational Photography, and more. Please spread the word to those you think might be interested. 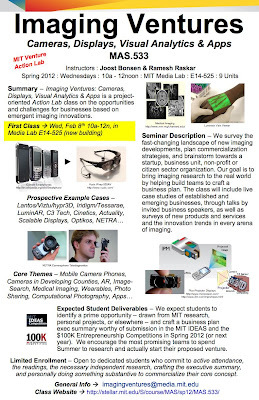 First class is this Wed morning February 8th, 2012 in Media Lab E14-525.